An island fishing community finds its livelihood threatened when a nearby nuclear power plant dumps radioactive water into the ocean. A photo journalist is doing an article on a nearby lab that is looking at ways to create bigger crabs to help feed starving people. She’s the daughter of the head of the nuclear power plant. Swarms of crabs start creeping on to the island and attacking people. Initially everyone blames some Haitian refugees for using voodoo. This dumb idea is quickly thrown to the side when a huge crab shows up and starts wrecking the village. Island Claws is a smorgasbord of eco-horror elements all smashed together into a slop that almost resembles a story. First it tries to throw the blame for the crab invasion on some radioactive water dumped in the crab’s habitat. Later it tries to point fingers at scientists doing hormone research. Throw in some locals with serious drinking problems and some Haitian refugees to conveniently be accused and stir. A more competent film could layer on all this uncertainty and tap into the doom and malaise that flavored the ecological horror of the 70s and early 80s. Island Claws isn’t that fortunate and instead has to make do with a lot of fumbling around before getting down to the monster action. 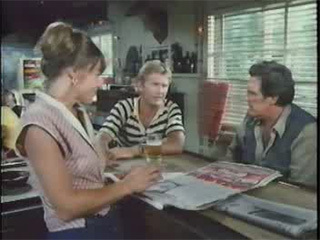 Would you like a side order of beer with your whiskey breakfast? Another notable feature of Island Claws is dialogue so terrible you would swear that the movie was attempting to be a parody. It’s filled with scientists who try to be witty and end up sounding like a classroom film on crabs. There are also plenty of drunk fishermen who aren’t convincingly drunk at all. The writing is bad, and the delivery is off. This kind of awkwardness is the only really engaging element of the film for the first forty minutes. Initially, the threat comes from lots of crabs and eventually, just one big one. The smaller crab attacks are more funny than scary. Watching grown adults panic at the sight of ten to twenty average sized crabs is entertaining but undermines any tension that was built. But, you know what move makers? Build an actual giant crab for your actors to run around and shoot at, and I will forgive quite a bit. 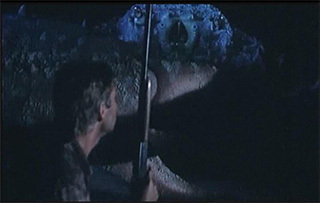 The final battle with the giant crab is almost fun enough to salvage to entire movie. I wish the rest of the Island Claws could have been near as energetic as its grand finale. 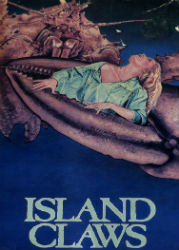 In spite (or possibly because) of its numerous flaws, I came away from Island Claws enjoying it. It has an endearing throw back attitude to creature feature films of the 50s. It can’t really decide whether to be somber look at a community and its problems or a monster crab movie, but when it decides to finally be a monster crab movie it’s tremendously fun. It's a minor entry into the eco-horror sub-genre, but not totally devoid of value.